The KTM 690 Duke has always been a fun street bike, with a fair amount of power wedged into a relatively light package. For 2016, the KTM 690 Duke learns some refinement though, most notably with an engine overhaul that drops the buzz from the motor, and adds power to the dyno chart. This comes about as the 690cc LC4 engine gains a secondary balancing shaft, a new crankshaft, and lighter pistons and connecting rods. All these changes come with a new cylinder head that has the exhaust valves on roller rockers, and the intake valves on the camshaft. The result is that the 2016 KTM 690 Duke gets a modest power gain – a 73hp peak horsepower figure – and a powerband that is 1,000 rpm wider than before. Add in a ride-by-wire throttle, with three riding modes, a slipper clutch, traction control, ABS, and motor slip regulation, and you’ve got one stout street bike. 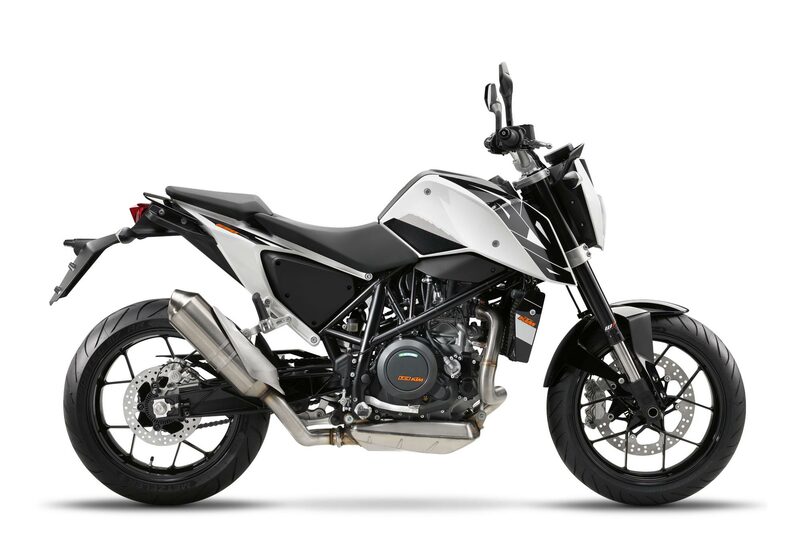 We know that the 2016 KTM 690 Duke will be coming to the USA, unfortunately it looks like its sibling the KTM 690 Duke R is not. We’ll take what we can get on this one, but hopefully KTM USA keeps the 690 Duke’s price nice and cheap, like it used to be.